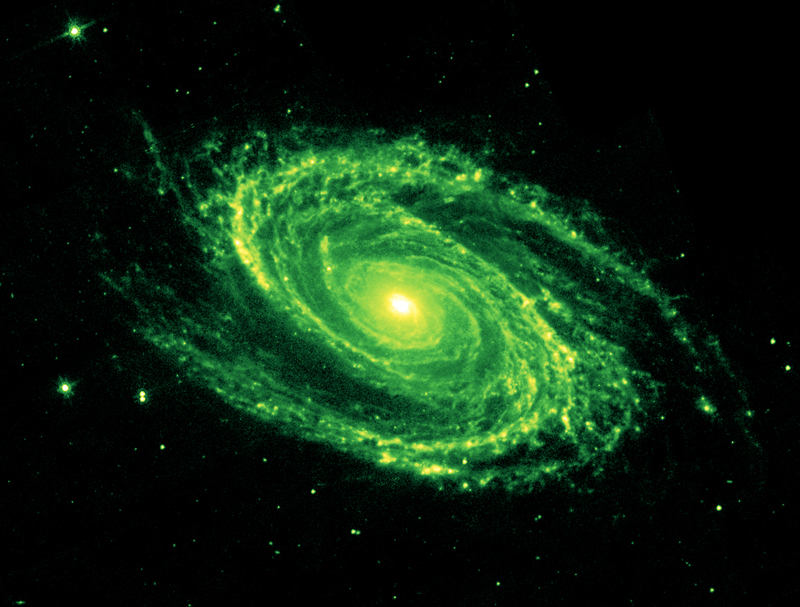 The magnificent spiral arms of the nearby galaxy Messier 81 are highlighted in this image from NASA's Spitzer Space Telescope. Located in the northern constellation of Ursa Major (which also includes the Big Dipper), this galaxy is easily visible through binoculars or a small telescope. 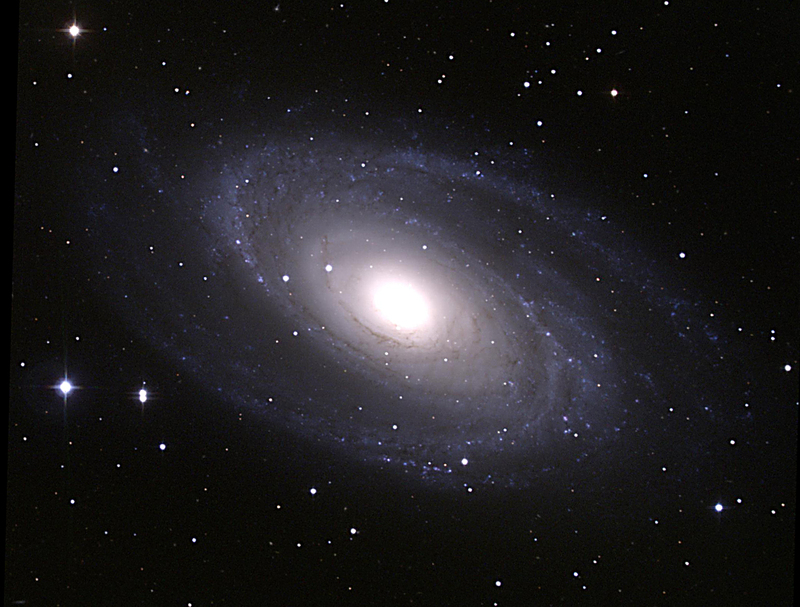 M81 is located at a distance of 12 million light-years. 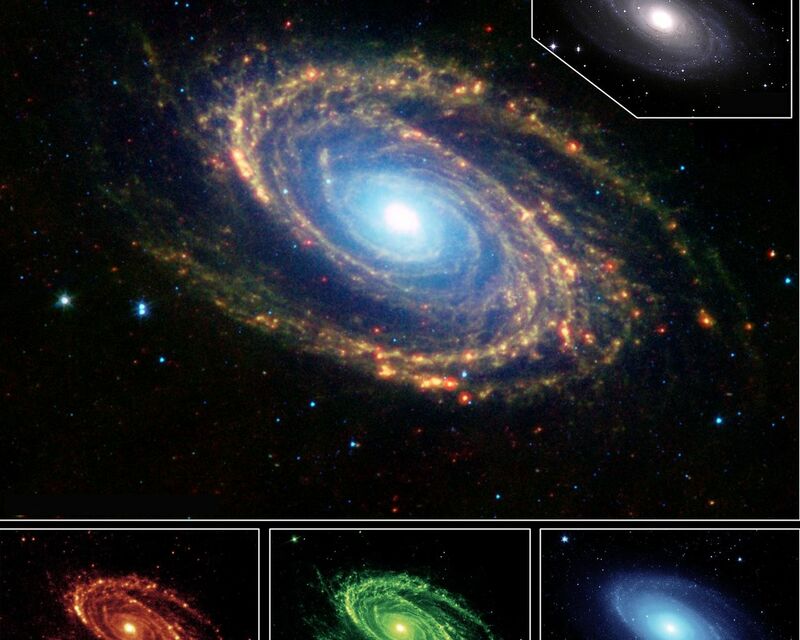 The main image is a composite mosaic obtained with the multiband imaging photometer for Spitzer and the infrared array camera. Thermal infrared emission at 24 microns detected by the photometer (red, bottom left inset) is combined with camera data at 8.0 microns (green, bottom center inset) and 3.6 microns (blue, bottom right inset). 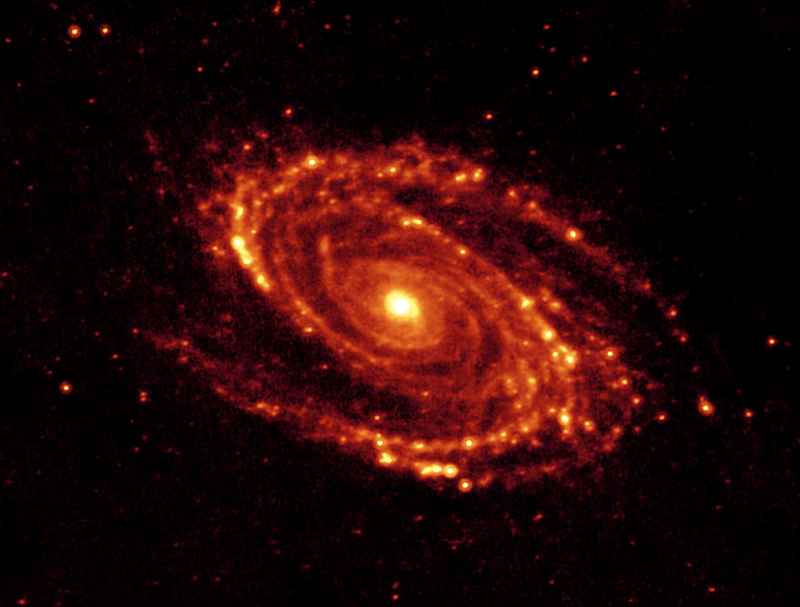 A visible-light image of Messier 81, obtained at Kitt Peak National Observatory, a ground-based telescope, is shown in the upper right inset. 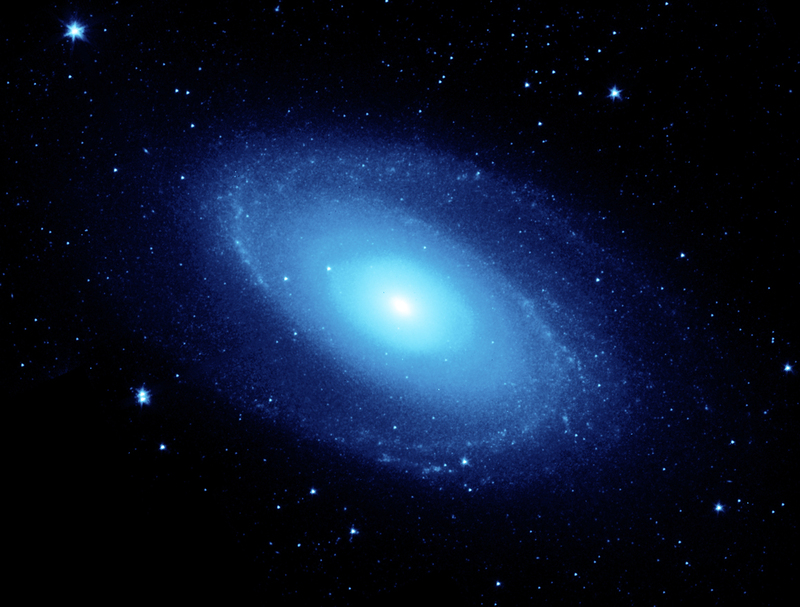 Both the visible-light picture and the 3.6-micron near-infrared image trace the distribution of stars, although the Spitzer image is virtually unaffected by obscuring dust. Both images reveal a very smooth stellar mass distribution, with the spiral arms relatively subdued. 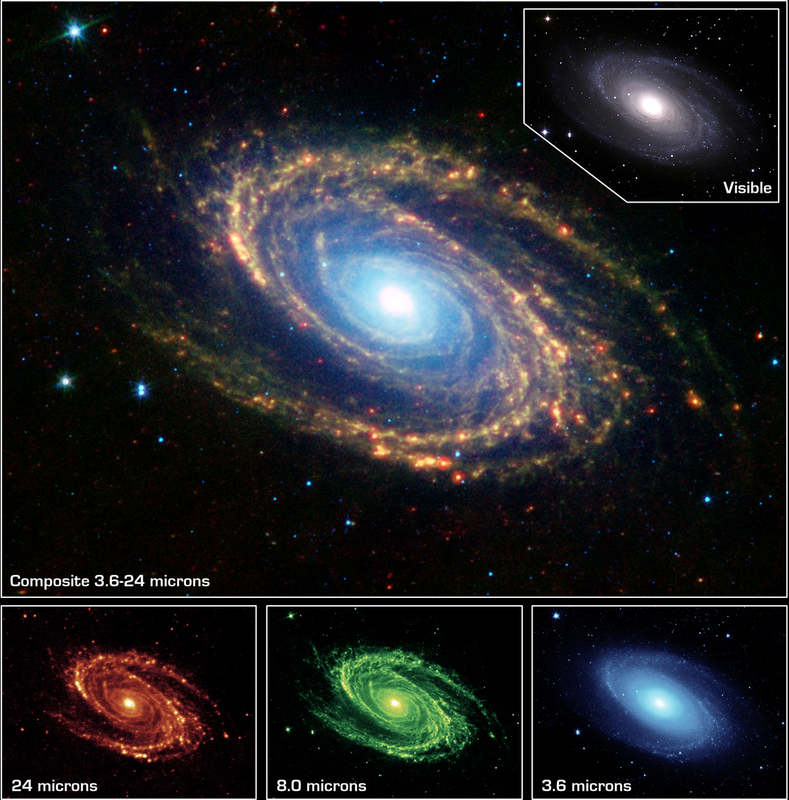 As one moves to longer wavelengths, the spiral arms become the dominant feature of the galaxy. The 8-micron emission is dominated by infrared light radiated by hot dust that has been heated by nearby luminous stars. 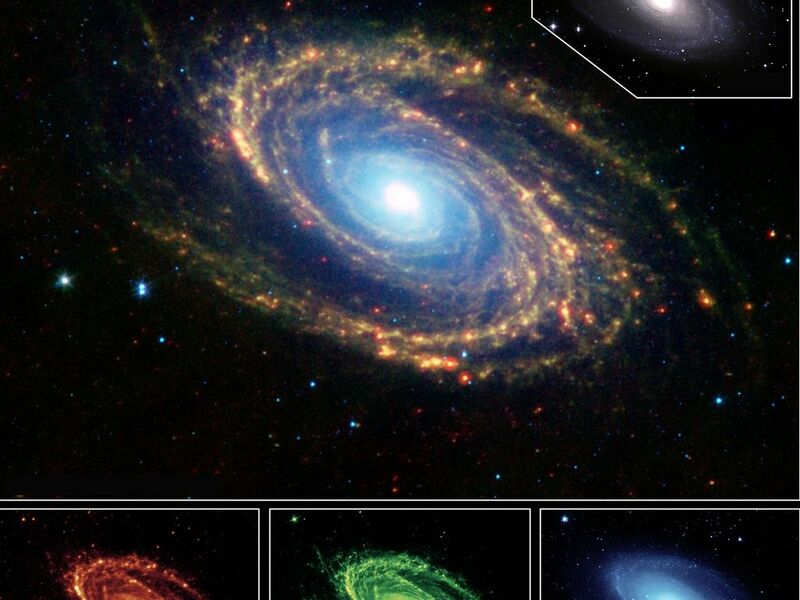 Dust in the galaxy is bathed by ultraviolet and visible light from nearby stars. Upon absorbing an ultraviolet or visible-light photon, a dust grain is heated and re-emits the energy at longer infrared wavelengths. 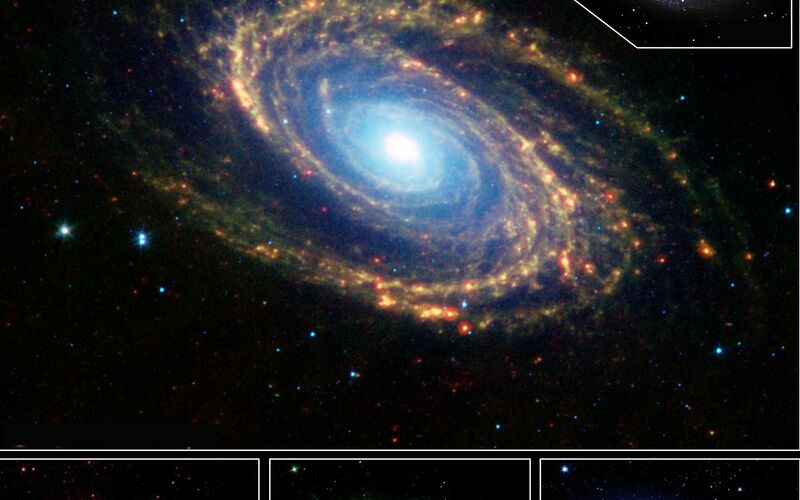 The dust particles are composed of silicates (chemically similar to beach sand), carbonaceous grains and polycyclic aromatic hydrocarbons and trace the gas distribution in the galaxy. The well-mixed gas (which is best detected at radio wavelengths) and dust provide a reservoir of raw materials for future star formation. The 24-micron multiband imaging photometer image shows emission from warm dust heated by the most luminous young stars. The infrared-bright clumpy knots within the spiral arms show where massive stars are being born in giant H II (ionized hydrogen) regions. Studying the locations of these star forming regions with respect to the overall mass distribution and other constituents of the galaxy (e.g., gas) will help identify the conditions and processes needed for star formation.